Walt Disney must have been disappointed when his first attempt at a live action musical, Babes in Toyland, turned out to be a box office bomb. Thankfully it didn't dissuade him from making more. Walt had another musical in mind for Annette Funicello based on a turn-of-the-century novel called Mother Carey's Chickens by Kate Douglas Wiggins. For unknown reasons, but probably because of Babes in Toyland, he gave the role to Hayley Mills, who had achieved success with songs from her films. The screenplay was adapted by Sally Benson, famous for writing Meet Me in St. Louis for MGM. James Nielson was chosen to direct, who had previously done Moon Pilot and Bon Voyage! One of the later film's stars, Deborah Walley, was cast in her second and last film for Disney. Dorothy McGuire (Old Yeller and Swiss Family Robinson) plays Mrs. Carey in her final Disney film. And popular singer Burl Ives returns to the studio, after a memorable role in 1948's So Dear to My Heart. Other familiar Disney faces include Una Markel (The Parent Trap) and Eddie Hodges, who later appeared in The Happiest Millionaire. For original songs, Walt turned to Richard and Robert Sherman, who had been at the studio for a few years writing small songs for films, including "Let's Get Together" from The Parent Trap. Seven original songs are used in the film. The film was entirely shot at The Walt Disney Studios. The film opens with a big storm as the credits play. As the storm clears, we are introduced to turn-of-the-century Boston at the Carey home, a family who recently lost the head of the house and are preparing to move due to financial problems. Daughter Nancy writes a letter to Osh Popham in Buelah, Maine and finds out that a yellow house they once visited is available to rent. They move to the house and it is revealed that Nancy lied to Osh Popham about the families circumstances, but all is forgiven. What the Careys don't know is that Osh never received clearance from the home's owner, Mr. Hamilton, to rent it out. Meanwhile, their cousin Julia comes to live with them. Julia annoyingly complains about the fine standards she's accustomed to and how their home can't compare. When the handsome, young new school teacher Mr. Bryant comes to town, Nancy and Julia start to compete for his attention. Julia wins his affection while Nancy is busy helping Osh fulfill an alleged request from Mr. Hamilton to throw a party in honor of his mother on Halloween, her birthday. A stranger arrives, who turns out to be Mr. Hamilton. Osh gives him all of Nancy's letters and he arrives at the party and escorts her, without revealing his name. The two begin to dance together at the party as the film ends. 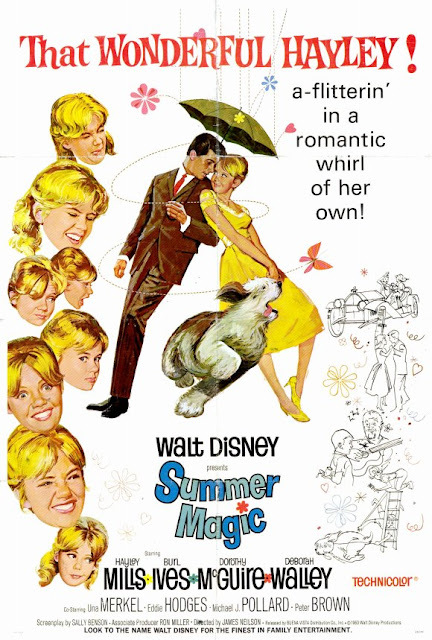 Summer Magic was released on July 7th, 1963. Critics were pretty harsh towards it, claiming that only children would find it entertaining and that the songs weren't memorable. However, audiences seemed to disagree. It made $4 million at the box office, proving itself a moderate hit. Hayley Mills was nominated for best actress at the Golden Globes for her performance. While it never received another theatrical release, it made its TV debut in 1965 and was released on home video for the first time in 1985. What Summer Magic lacks in plot it makes up for in charm. It's easy to see why critics weren't thrilled, but anybody who is nostalgic for simpler times will fined themselves feeling very cozy watching this film. All of the actors give delightful performances and the Sherman Brothers songs are catchy. "Ugly Bug Ball" has gone on to become somewhat of a children's classic. Walt Disney allegedly wasn't trilled with the song, but the Shermans convinced him to keep it in the film. Another song called "On the Front Porch" is Richard Sherman's favorite song he ever wrote. My personal favorite song in the film is called "Flitterin. '"Visitors to Disneyland and Walt Disney World have unknowingly heard many of the songs before because instrumental versions make up much of the area music on Main Street (some of the other songs come from another Disney/Sherman musical, The Happiest Millionaire). And visitors to the Magic Kingdom in Florida with a keen eye may even notice who the proprietor of the Emporium is... none other than Osh Popham!Another interesting fact is that a film version of Mother Carey's Chickens had been made by RKO in 1938 starring Ruby Keeler. RKO was Walt Disney's distributor at the time. Summer Magic is currently available on DVD. The film is presented in its original theatrical widescreen aspect ratio of 1.75:1 and a decent restoration was done. There are no bonus features. It is also available on iTunes in widescreen, where it can also be purchased in HD. The yellow house was a set on the backlot at the Walt Disney Studios in Burbank. The backlot has been destroyed and business buildings and soundstages have been erected on the site, but it has been reported that the yellow house was the last piece of the backlot standing because it was on such a small piece of land on the outskirts of the lot. Thanks for this write up. I'm doing this movie on my podcast this week (The Corner of Hollywood and Broadway) and information on the making of is hard to find. This has been very informative.